For Brendan Jennings, show choir competitions are about more than just being able to sing well and display showmanship. They're about being able to pull at the heartstrings of the audience and make them feel the music, according to Jennings, vocal music director at John Burroughs High School. John Burroughs' famed show choirs — Powerhouse and Sound Sensations — brought home high honors during a competition at the Wheaton Warrenville South Classic in a suburb outside of Chicago this past Saturday. Sound Sensations, an all-girls group, was named grand champion for the unisex division, while Powerhouse came in second place overall. "The performances are based on the emotion of the kids and the way they tell a story, " Jennings said. "It's not about who can be the sparkliest and the most perfect. It's about who can be the most real and impactful, and that's what entertainment is today. It's not all flash." 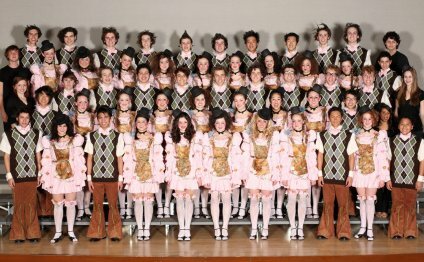 Both the Powerhouse and Sound Sensations show choirs are known globally and have performed across the United States and around the world. Their celebrity status is due, in part, to the TV show "Glee." Its creators used the John Burroughs choirs as inspiration for the show. The Sound Sensations performed a 1960s Motown-style show about backup singers who want to be the stars of the show instead of being a supporting act. Members of Powerhouse took on a dark theme, setting their show in a 1919 hotel in California that houses trapped souls. Senior Faydean Kielty had a solo during the performance and was so good, she won best female solo performance at the competition. Faydean has been a member of Powerhouse the last two years and said that she is honored to be part of a well-respected choir program. "The amount of love and support that we got was probably the most overwhelming part of it all, " she said. "We just had so many people coming up to us and telling us how much they loved our show and that they've been waiting to see us perform for so many years. There were even people that drove for five hours just so see us and they weren't even part of a choir." Jennings said he thinks that other schools nationwide have stepped up their performances because of what Powerhouse and Sound Sensations have brought to the stage over the years. "There are definitely schools that are starting to integrate our style into theirs, " he said. "In the last 10 years, there has been a shift in show choir performances. It used to be laughably pageant-like. But then we came in and were one of the main influences of changing that."